Where to exchange foreign currencies? Credit card or cash while travelling in Germany? The German currency is the Euro. Actually, the Euro is not "German money", but it is the currency we use in this country. The Euro replaced the German Mark and it is the official currency of the European Union. Nineteen states in Europe currently use the Euro. These states are Austria, Belgium, Cyprus, Estonia, Finland, France, Germany, Greece, Ireland, Italy, Latvia, Lithuania, Luxembourg, Malta, the Netherlands, Portugal, Slovakia, Slovenia and Spain. If you visit Germany from a country within the eurozone, you are a happy traveller! No need to worry about the best exchange rates before you leave home. While you travel in Germany, you don't need to calculate prices into another currency. Isn't it very handy to travel in a foreign country with the currency you are used to? The Euro was introduced as cash currency in Germany on 1st January 2002, although it was used for cashless transactions by banks and stock markets in the eurozone since 1999. An Euro starter kit, to get people used to the new German currency, was released on 17th December 2001. Not all Germans were happy about the introduction of the Euro. Many fellow Germans wanted to keep the strong Deutsche Mark. Others were angry that we didn't have a referendum like other European countries. In Germany, the introduction of the Euro was the sole decision of our political leaders. Now we all got used to the Euro, although you will still hear voices who say that expenses for daily life have become more expensive. 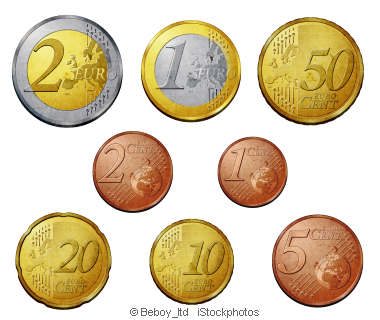 All Euro coins have a common side showing their value, while the national side shows an image chosen by each country. Euro coins from any member state are valid in all states throughout the Euro zone. 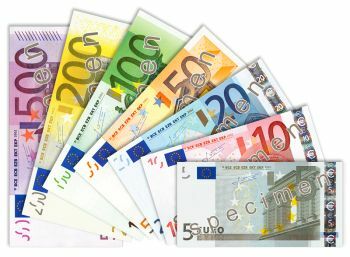 The Euro notes, front and back side, are the same in all countries. How to pay in Germany? For visitors from outside the Euro zone the below online currency converter tool is handy to check how many Euro you get for your local currency. Credit cards are widely accepted, although paying with credit cards is not as common as in the USA, for example. Mastercard & Visa dominate. American Express & Diners Club are accepted in some stores and of course you can use them with the Geldautomat. Check shop windows and entrance doors for credit card logos to see which cards you can use inside. Supermarkets, department stores and restaurants, especially in smaller towns outside tourist regions, might only accept a German bank card, or cash. You will definitely have to pay cash at many locations in Germany. 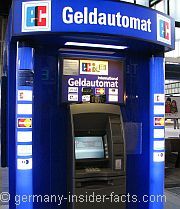 You can get money from a Geldautomat (ATM - automated teller machine) at major train stations, airports, large shopping centres and in and outside banks. Within the eurozone charges for ATM withdrawals and credit card payments are domestic payments and you get domestic fees charged. For visitors from the US, Canada, Australia and any other country outside the eurozone it is a different story. You can buy currency online and spend hours searching for the best exchange rates. Does it make sense? I don't know. I did some research, and discovered that many experienced world travellers do exactly what I do when I go abroad. Accept that you have to pay transaction fees when you buy foreign currency. Don't fret over the best exchange rates, instead use time time to plan your holidays. Use a mix of payment methods while you travel in Germany. Talk with your bank at home to check what they charge if you withdraw foreign currency with your credit card or your bank card. Your bank card should have a Visa, Mastercard or EuroCard logo to work with ATMs in Germany and Europe. Don't forget to memorise the PIN for these cards. Consider buying some traveller checks issued in Euro to get cash in Germany. You might also be able to use them to pay in shops and hotels. Use your credit card to pay for accommodation, car rentals, fuel and purchases over 100? Exchange money in Germany/Europe, not at home. Banks usually give you better exchange rates than commercial foreign exchange counters at airports and major railway stations. If you cash traveller checks or withdraw money from an ATM you might have to pay a fee per transaction. So don't withdraw a small amount daily, better get the money you need for the next few days. Bring a small amount of Euros from home. So you don't need to panic when you arrive in Germany outside working hours of banks.